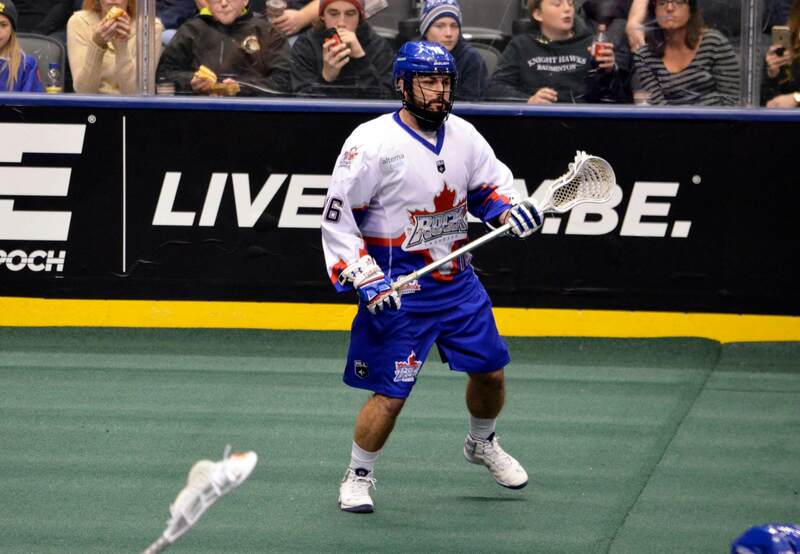 Adam Jones said the Toronto Rock didn’t want to go down 0-3 in their young NLL season. His team had December 30th circled on their calendar as a rematch of their season opener in Buffalo, a 13-9 loss. The Rock were determined to right the ship and score their first win while getting revenge on their closest rivals. 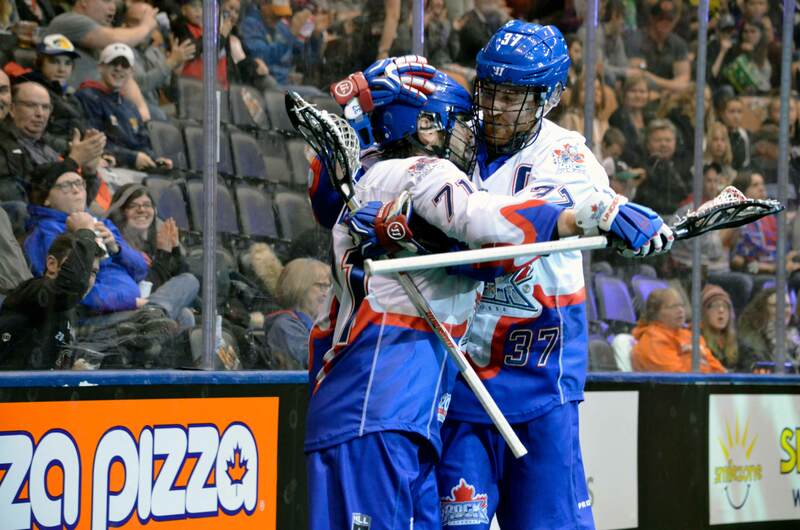 Jones led the way, scoring four times and adding five assists en route to an explosive 20-13 win against the Bandits. Toronto’s Nick Rose faced-off against Buffalo’s Alex Buque once again in goal. In contrast to the season opener, the Bandits scored first on an impressive individual effort from Callum Crawford, who picked his own rebound shot off the glass and stung it off the inside post by Rose’s right foot. The deficit didn’t last long as back-to-back Rock goals put them up 2-1 just over halfway through the frame. Just as the scoreboard operator posted the second Rock goal, a zinger from Rob Hellyer, Nick Weiss zoomed the ball past Rose and picked the top right corner which tied the game at two. Fast forward to the three minute mark of the first quarter: Dhane Smith followed up Drew Belgrave’s first career goal by carrying three Rock defenders on his back and scoring his first of two on a dunk shot at Rose’s right foot. Tied at three. But, back-to-back-to-back goals swung open the door of momentum for the Rock. Rookie Dan Craig scored his first pro goal. Tom Schreiber and Sheldon Burns also scored for a three-goal lead. The first quarter did not end peacefully as a brawl around Rose erupted as a stinger to his neck sparked a sea of black and orange jerseys mixing with blue and red as Rose was swallowed by the sea of colours which sparked into fisticuffs. Two players from each team went to the box. Schreiber ended Buque’s night two minutes into the second quarter, scoring as his helmet was knocked off. Buque allowed seven goals on 17 shots and gave way to recently signed Zach Higgins, who allowed a goal by Adam Jones on the first shot he faced. The Bandits responded from the goalie change and went on a four-goal run capped off by Crawford’s third of the night, bringing the black and orange within one as the Rock held an 8-7 lead. The goal was challenged but the call on the floor stood. Less than three minutes later the Rock and Bandits traded goals: for Toronto, from Challen Rogers on a breakaway, and for Buffalo, Mark Steenhuis, who made it 9-8. Two in a row from Brett Hickey, his first on a cross-crease dive and his second on a point-blank rip past Higgins, and one from Hellyer, gave the Rock at 12-8 lead at halftime. Both teams went to the locker room at halftime after a physically challenging 30 minutes, totaling over 20 penalty minutes and 20 goals between them. 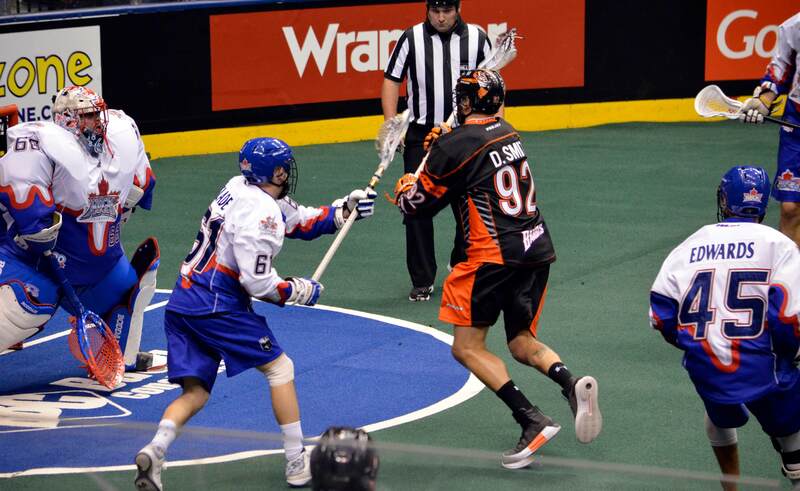 The Bandits tried hard, and though they outscored the Rock 3-2 in the third quarter, they couldn’t erase the deficit and trailed 14-11. Goal numbers 15 and 16 for the Rock rang out in a matter of seconds as Schreiber and Hellyer completed hat-tricks in the first minute of the fourth quarter. A pair from Jones later in the frame gave the Rock a commanding lead. With so many goals and goal scorers during the game, the final score resembled a football game rather than a lacrosse game. Jones pointed out the team contributions recognizing Belgrave, Craig and Burns who all scored their first Rock goals. With that 25 seconds remaining on the shot clock, both teams made the best of their chances, but the Rock were able to capitalize on transition efforts more and because of that, the Rock improve to 1-2 as the Bandits fall to 1-2. Rose made 39 saves on 52 shots as Buque and Higgins combined for 41 saves. The Rock will ring in the new year as they visit the 0-3 Vancouver Stealth at the Langley Events Centre on January 6th while the Bandits are off until January 13th, when they get their own chance at the Vancouver Stealth at the KeyBank Center in Buffalo.